PADI | SSI | S.C.U.B.A. Discover the beauty that lies just beyond our very own white sandy beach! 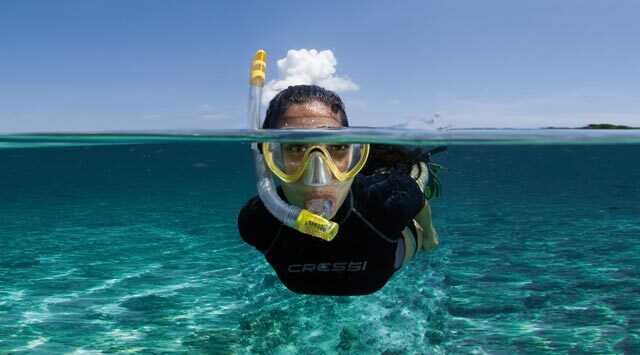 Find out the best times to go snorkeling and at which areas. Get all the tips and uncover the hidden beauties of our house reef with our snorkeling guides. Our guides have an extensive local knowledge of the Maldivian reefs and the marine life around it. Come and experience all this at the dive center, every day at 11am, with our guides. No sign up or paperwork required! Just show up on the day that is most convenient for you. If you don’t have your own snorkeling equipment, you can rent sets of equipment from the dive center.